Nathaniel Ingleby was printed in the July 1997 issue of the newsletter. It was written and illustrated by club member and then editor Shaun Whitehead. It tells the story of a Victorian time traveller and his journey into the future, where he hid a small inscribed brass disk. By solving the clues in the story you were led to a location where the brass disk was hidden. 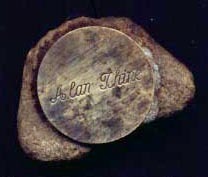 The disk was inscribed with a name, which would serve as proof of the finders claim. The puzzle lasted for eight months before Paul Harkin and Martin Dennett located the brass disk hidden at Easby Abbey in Yorkshire.